In Spanish, The Itsy Bitsy Spider is La araña pequeñita, La itzi bitzi araña, Winsy, winsy araña or Wichi, wichi araña. Like most traditional rhymes, the words to this finger play vary a bit depending on region. 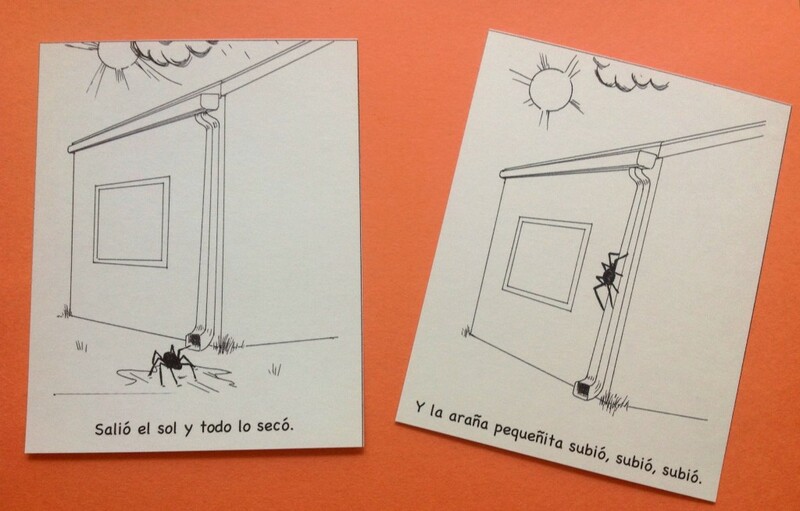 You can read about several different versions here: The Itsy Bitsy Spider in Spanish. The printable sequence cards below extend the language and learning in this simple rhyme. The link to the printable is at the end of the post. La arana pequeñita subió, subió, subió. Y la araña pequeñita subió, subió, subió. Whether you are playing with your child at home or teaching a class, you want children to say the Itsy Bitsy Spider in Spanish many times and to engage with the language in different ways. One of my favorite activities for this is sequence cards. Kids can color the cards, use them in order to sing the song, order them as they sing, and make them into a mini book. For sequencing, print the cards on card stock. I have included versions with and without text. How we do the rhyme and activities depends on the children. This is a possible order, spread over several days. We always sing the Itsy Bitsy Spider in Spanish with the actions before doing other activities. 1. Learn the song and the finger play. 3. Do the finger play. Kids color the cards. Reinforce vocabulary (below) by talking about the cards as they color. 4. Order the cards as a group or individually as you sing the song. 5. Make the cards into a mini-book. Kids can make a cool spider cover. 6. Read spider books. Do additional spider crafts. As you order the cards, you can also use primero, segundo, tercero, cuarto, entonces, después. Here is a video of the Itsy Bitsy Spider in Spanish from the San Bernadino County Library. This is awesome! I love your site, and can’t wait to find more stuff to use with my students. 🙂 Thanks for sharing! Gracias! Love the sequencing card of the itsy bitsy spider! My baby knows the song by heart in Spanish and this will be perfect to compliment the song he’s already familiar with! Hola! me gusta ,mucho tu pagina!!!! My students love this fingerplay.